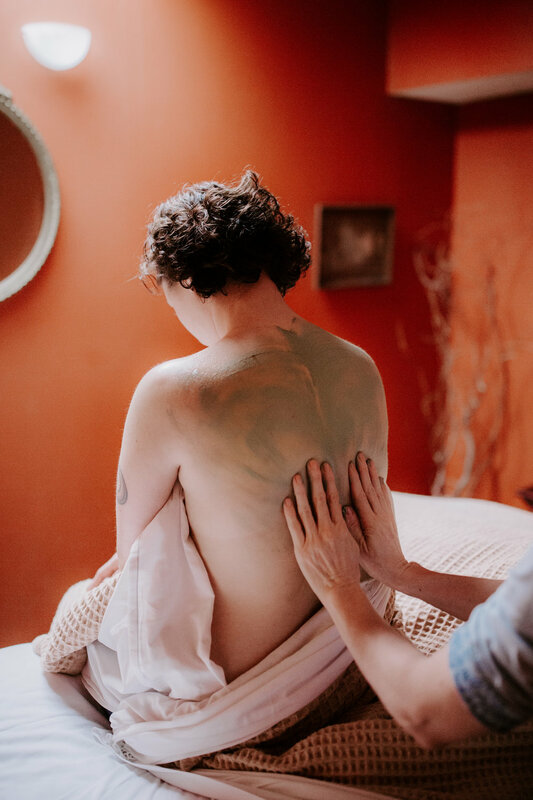 From a relaxing massage to therapeutic work, our highly trained and experienced licensed massage therapists will help you customize a massage session that will work in sync with your body. You can request whether you prefer deep tissue work, a lighter touch, or something in between. We value your business and enjoy having you in time after time. As a thank you, we offer $5 off your next massage when rescheduling at your time of service . Only good for 60 or 90 minute massages booked within 30 days. Our private steam room will leave you warm to the core. Your choice of peppermint, lavender, eucalyptus and sweet orange. Can be added before of after a treatment. Only 2 people maximum per session. Enjoy a soak in a private claw foot tub, rich with minerals from pink Himalayan salt. Essential oils included. Your choice of peppermint, lavender, eucalyptus, and sweet orange. Can be added before or after a treatment. Aromatherapy steam towels cocoon your feet before and after a lemongrass peppermint exfoliating scrub, followed by a foot massage. You can enjoy this treatment a la carte or add it to a massage. For men and women. Steam towels, deep cleansing, exfoliation, raw, local honey masque and skin hydration with shoulder, neck and arm massage. Aromatherapy upon request. All specialty services are priced the same as listed at the top of the page unless otherwise noted. Enjoy a massage next to your partner. The therapist uses their feet to provide a broad, deep pressure without leaving you feeling sore the next day. Balance bars are installed on the ceiling overhead the therapist for balance and to control the amount of pressure the client is comfortable with. The client must be in good physical health to receive ashiatsu. Body cushions are provided to ensure maximum comfort for momma to be. Stimulates zones on the feet that corresponds to the organs of the body. Promotes healing and relaxation. An organized system of bodywork designed to align the structure of the body with gravity. Structural Integration works to unravel the postural patterns caused by physical or emotional trauma. Receive private training with yourself, a partner, and one of our experienced massage therapists. Your session will be designed around what you want to learn. Do you have a friend that suffers from headaches? Or maybe you want to learn to give your partner a tension relieving neck and shoulder massage. Whatever it may be we are here to help. In the session you will be on the massage table receiving massage, and will also be walked through the steps in proper body mechanics and how to be confident giving bodywork. Allow at least 90 minutes. Take some much needed time for yourself with one of our amazing spa packages. Please schedule in as far in advance as possible as these do book up quickly. We are happy to answer any questions you might have regarding these treatments. Allow 2 hours for each package. Aromatherapy steam, half hour massage and spa facial massage. Sea salt bath, hour massage, half hour essential foot treatment. An hour massage and our signature spa facial massage. An hour of integrative energy work and an hour of massage- relaxation or deep tissue. The ultimate. A scalp massage, spa facial massage, half hour massage and heated stone leg and foot massage. Designed for 2. Dry brushing, hour side by side massage, half hour essential foot treatment and sparking cider. Warming seaweed body masque stimulates body functions and assists in elimination of toxins while replacing essential minerals. Mud treatments can help reduce water retention, muscle aches, joint pain, and skin maladies. Balancing and soothing. Jojoba beads and coconut oil are used to provide a gentle but effective exfoliant and deep relaxation for the body and mind. Exfoliation helps with the removal of dead skin and will increase circulation, leading to healthier looking, glowing skin. Stimulating treatment which improves circulation and leaves your skin feeling soft and silky smooth. Sea Salts are known for their rich concentration of active minerals which helps to detoxify internal organs and flush the lymph system.